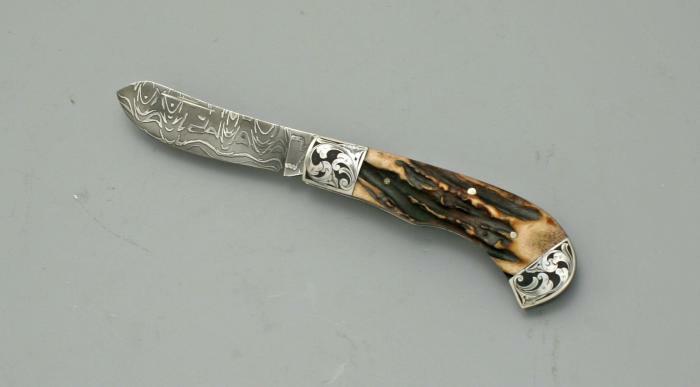 This is a Folding Sport knife. Selva. This knife suits well as a medium sized folding hunter, it works well with a variety of outdoor sports. I have used my pattern for nearly a year now with very good results. This is the first one of these offered to the public. The weight is good-- the half stop snaps right in with a good light spring action. It will be rare to find a stag handle this size with this much 'pattern' going on. I took this model to the Amazon this year to test it in the field under harsh conditions. I personally will not be without this model. I have mine thrown in my outdoor ditty bag. It whittles well for making the small shavings required to build a fire, it skins well and it slices well and serve as a nice letter opener in the office. Whether it is for your collection or if you want a folding hunter for your many other outdoor activities, this knife is for you. Wether it is for your collection or ff you want a folding hunter that suits as well as other things you do outdoors this knife is for you.